This antibody is specific for Rho. It is also expected to detect RhoA, RhoB and RhoC. Synthetic peptide within Human Rho (N terminal). The exact sequence is proprietary. Our Abpromise guarantee covers the use of ab40673 in the following tested applications. WB 1/1000 - 1/5000. Detects a band of approximately 22 kDa (predicted molecular weight: 21 kDa). The basic-rich region is essential for yopT recognition and cleavage. Cell membrane. Cytoplasm > cytoskeleton. Cleavage furrow. Cytoplasm > cell cortex. Midbody. Localized to cell-cell contacts in calcium-treated keratinocytes (By similarity). Translocates to the equatorial region before furrow formation in a ECT2-dependent manner. Localizes to the equatorial cell cortex (at the site of the presumptive furrow) in early anaphase in a activated form and in a myosin- and actin-independent manner. Immunohistochemical staining of paraffin embedded human thyroid carcinoma with purified ab40673 at a working dilution of 1 in 250. 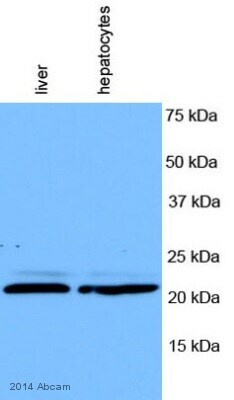 The secondary antibody used is a HRP polymer for rabbit IgG. The sample is counter-stained with hematoxylin. Antigen retrieval was perfomed using Tris-EDTA buffer, pH 9.0. PBS was used instead of the primary antibody as the negative control, and is shown in the inset. Immunofluorescence staining of MCF7 cells with purified ab40673 at a working dilution of 1 in 250, counter-stained with DAPI. 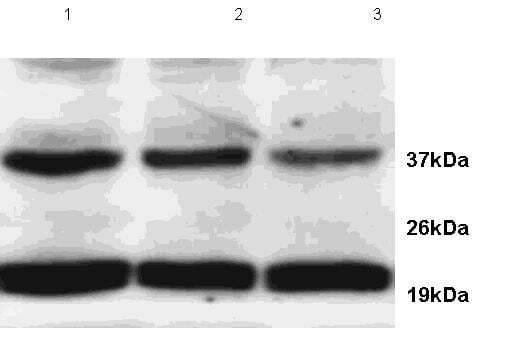 The secondary antibody was Alexa Fluor® 488 goat anti rabbit, used at a dilution of 1 in 500. The cells were fixed in 4% PFA and permeabilized using 0.1% Triton X 100. 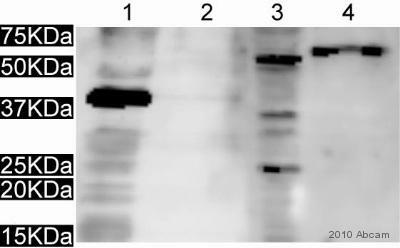 The negative control is shown in bottom right hand panel - for the negative control, PBS was used as primary, followed by an Alexa Fluor® 488 goat anti-rabbit secondary (ab150077) at a dilution of 1/500. Observed band size: 22 kDa why is the actual band size different from the predicted? Publishing research using ab40673? Please let us know so that we can cite the reference in this datasheet. La concentration du RabMab anti-Rho ab40673 lot GR141864-2 est 0.692 mg/ml.